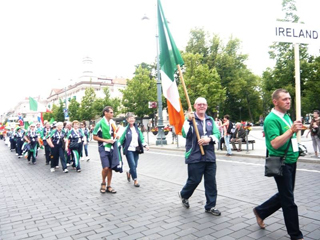 Congratulations to the nine Athletes who represented Ireland at the European Heart and Lung Transplant Championships in Vilnius, Lithuania. Between them they won six Gold Medals, ten Silver Medals and eight Bronze Medals. A real tribute to their Donors and all Donors. Frank Galvin is a 56-year-old recipient of a heart transplant. Married with 5 children, Frank was first diagnosed with a crippling virus in 2010 which was attacking his heart. Following the insertion of an ICD, Frank’s health improved greatly until October 2014, when it was discovered that he was suffering from heart failure, the only solution to which was a transplant. An inpatient of Blanchardstown Hospital for 10 months, Frank received a heart through the generosity of a donor family in late July 2015. The procedure itself went exceedingly well, although Frank did suffer a few problems shortly thereafter. While the medicines took some getting used to and, indeed, have their own unique problems and side-effects, Frank now believes he has turned a corner. As he told us himself, the anniversary of his transplant will be a happy occasion for himself and family, but tinged with sadness for his donor’s family.